A wordhunt game that requires the player to decipher headlines from real-time news feeds, The Daily Headhunt offers a new way to encounter online information: with the deliberation and attention to detail required to solve the puzzle. During the game, you are given the source of a headline and the lead paragraph of the article. Can you reconstruct the headline's straight, slanted, clever, playful, or just plain enigmatic language? The Daily Headhunt offers a fresh way to encounter online news information and suggests that media consumption need not be the passive, mind-pickling activity we're accustomed to. Solving the Headhunt requires creativity, close scrutiny of language and logic, and attention to editorial choice. Awareness of world events, of potential political biases, and of fashionable words and phrases in the press, also comes into play. It is our humble hope that, over time, those who play The Daily Headhunt will begin to develop new habits of media consumption — habits constellated around ideas of discovery, inquiry, and play, not the metaphors of "consumption" and "digestion." These habits, we believe, will become the hallmarks of the new media literate. Note: This is not a stable release. Please report any problems or bugs. 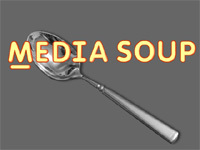 Media Soup is an action word game made in the mold of The Daily Headhunt. This time, you are adrift in a soup of letters from online news headlines, and you must battle your way through the barrage of information by correctly identifying the missing word and trapping the letters needed to spell it. Media Soup is essentially the classic video game Asteroids with a twist. Playing Media Soup challenges not only your deftness as a gamer and your language-savvy, but your ability to use the two simultaneously in the realistic chaos of The Soup.